John Simpson is a British artist who originally made an impact with illustrations for streetwear brand Carhartt and collaborations with fashion designer Wale Adeyemi. 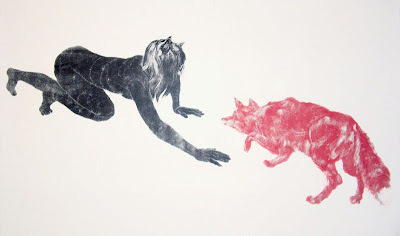 Unique hand-executed monotypes provide the focus for his creativity, the delicate process resulting in work caught somewhere between childhood imagination and adult reasoning. Simpson creates and enlivens mythological and fairy-tale animals in scenes that range from violent to tender. His subtlety of expression produces images that can be imbued with aggressive energy and yet simultaneously display a fragile beauty. The works articulate primal instincts through anthropomorphic characters that provoke human empathy and identification. Despite the initial influence of urban art and street graphics, drawing has always been the most important element of his work, with imagery strongly relating to the visual tradition of artists Goya and Redon. In addition to his sell-out show at ocontemporary last year, Simpson has exhibited to acclaim in New York and continues to show in both the US and UK. His first London solo show opens tomorrow evening the 20th with a private view at Ocontemporary. The show which opens to the public on the 21 November will feature new works and a selection of new screenprints.